State Member for Chatsworth, Steve Minnikin and Federal Member for Bonner, Ross Vasta addressed the Carindale Community Forum at Pacific Golf Club last night to raise the issue of the post office move from Westfield Carindale. Mr Vasta said that he was having a meeting at his office with Australia Post on Thursday to discuss the issue. “I hope that we can actually resolve this sooner rather than later,” he said. As we announced on 29th January, Australia Post plans to close at Westfield Carindale on April 26th and reopen at the Metropol on April 29th. 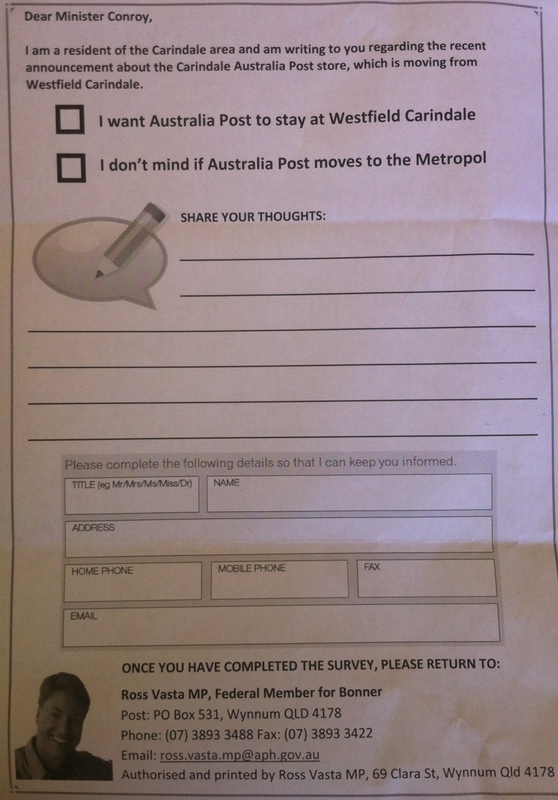 Mr Vasta’s office recently sent a hard copy survey to local residents asking their views about the move. The survey, Mr Vasta said, of over 8000 residents showed that: “overwhelming support was for the Australia Post to remain where it is there in Carindale”. The negotiations, Mr Minnikin explained, started off with Westfield wanting Australia Post to move from its current spot, but not necessarily relocate outside of the centre. “But the dialogue then started to take a bit of a plummet down south,” Mr Minnikin said. “I’ve got a distinct problem with having a Carindale post office and it’s not in Carindale,” Mr Minnikin said. Mr Vasta said the post office move, which will mean a move from the Bonner electorate to the Griffith electorate will mean it loses representation. He also said he was disappointed with the lack of consultation by Westfield and Australia Post with local representatives. “It was a massive clash of egos, that’s really what it was,” Mr Vasta said. He says he’s aiming to work with Senator Stephen Conroy on the issue. 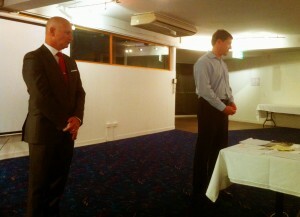 The Carindale Community Forum has been running for 18 months. This event was the first forum for 2013 and the first at the Pacific Golf Club location (where it will be located for at least the rest of this year). The forum is held on the last Wednesday of the month and is open to all locals. This was Mr Vasta’s first attendance at the forum, but he told the group that, unless required in Canberra, he would be attending them all. In this Federal Election year we can expect an increased range of local issues to be heard at the community forum so it would be wise for locals to take advantage of this access to local leaders and use it raise questions and issues. In regard to community hubs, we have the Carina State School that’s in Carindale and the Carindale PCYC that’s in Carina; so I’m not sure the name is a good argument as to why it shouldn’t relocate. The ease of access in and out of Metropol certainly is and I certainly won’t be using the Post Office at Metropol. No one will be able to go to the post office at the Metropol because it is a complete disaster in traffic management already! There is only one way out and often it is impossible to turn right and back onto Creek Road because traffic banks bank and can’t get through the lights. The council would need to completely redevelop the entries and exit to prevent a traffic standstill at that intersection – that is if people go to that post office. That post office is doomed. Go Vasta! We all know this is true. Keep up the good work!